Angry Dude is chatty yet moody character. Install the app to start chatting to him now! You might be in for a nice conversation. However, be careful because you could start an argument! 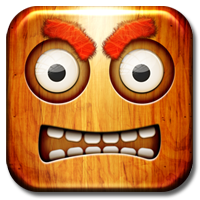 Angry Dude is a collaboration between Firezoo, makers of Smash Dude and Santa Dude, and Existor. Firezoo provided the graphics and interface, and Cleverscript provides the AI, via the Clever Data feature. It runs on iOS. Released September 2013.